The BC government announced in June its plans for increasing aboriginal involvement in post-secondary institutions — a move which is greatly needed, according to one First Nations post-secondary liaison and student. On June 12, the Liberal government released its Aboriginal Post-Secondary Action Plan, outlining goals and objectives to increase aboriginal involvement at higher education institutes across B.C. until 2020. The plan includes funding a number of initiatives such as a $16.2 million this year for financial assistance to aboriginal students. Aboriginal Service Plan. Some also goes towards emergency financial assistance and awards. Dolly Reno, First Nations liaison of the Capilano University Students Association, said that she thinks it’s great the government is doing more for aboriginal students, but that there should be more of a focus on reducing red tape. Though she is from Mi’kmaq First Nations band in Nova Scotia, she is most familiar with West Coast traditions. She organized a pow-wow at Capilano on Sept. 13 as a way to expose the community to First Nations culture. While she believes that her pow-wow was a success, she said that that’s not always the case for those looking to organize First Nations events. According to Shirley Hardman, the senior advisor on Indigenous Affairs at the University of the Fraser Valley in Chilliwack, it’s imperative that post-secondary institutions find alternative ways of offering First Nations education. Teams from 33 colleges and universities across the province gather to discuss how to make sure that indigenous culture and values are integrated across all levels of university and not just confined to specialized classes. As a Shxwhá:y village band member, Hardman said that over the past ten years, the post-secondary sector has focused on working with the aboriginal community to determine what aboriginal education should look like, as opposed to institutions making curriculum decisions on their own. But one of the challenges facing both grassroots movements and the province’s initiatives is getting people to accept new ways of approaching aboriginal education. “The initiatives have really been gung-ho in the past 15 years,” said Hardman. “But anyone who was educated prior to that [time] wasn’t educated in the same way — the initiatives aren’t fully embraced by all segments of society,” said Hardman. While there is still a lot of work to do according to Hardman, the government programs have been making a difference. The Ministry of Advanced Education provided $600,000 to build a new long house at UFV’s Chilliwack campus three years ago, as part of a province-wide initiative to create First Nations gathering spaces. Other numbers show more aboriginal students have been seeking post-secondary education as well. 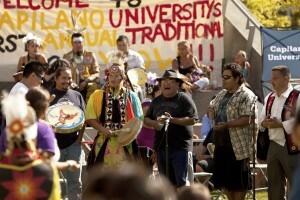 According to a ministry service plan report, the number of aboriginal students enrolled in post-secondary institutions rose from around 24,000 in 2009-10 to 24,862 in 2011-12. Looking further back, those who were awarded university credentials rose from 2,100 students in 2005-06 to 2,634 in 2009-10. 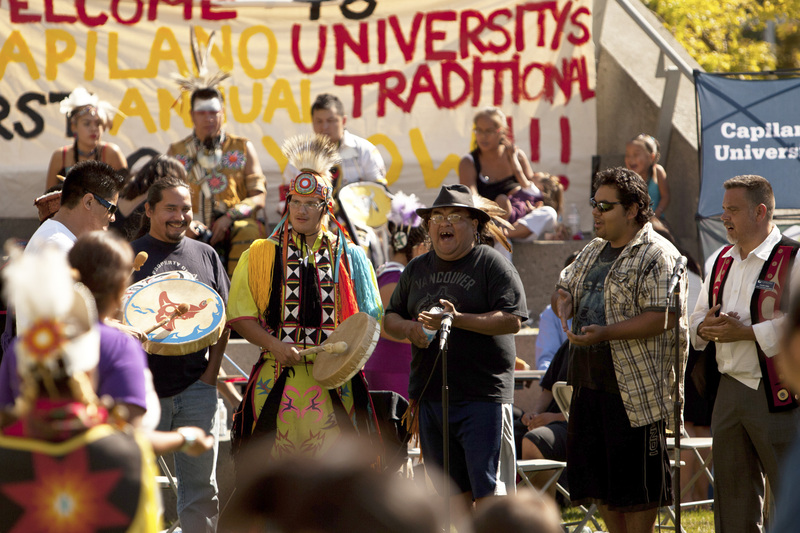 Reno hopes others will get involved and the trend continues, due to the increased opportunities for post-secondary aboriginal graduates. “For aboriginal people, a lot of the doors have been closed before or how to navigate post-secondary is not immediately clear when you don’t have a role model there before you to guide you,” she said.